For the past year and a half, the first day of the work week here at MyShingle has been Make Money Mondays , where I’ve shared a new marketing or practice idea to help your firm grow its revenue. If you’ve followed the feature and applied our advice, you ought to have some extra spending money lying around to participate in our first Spend Money Monday. Today, we’re excited to kick off a couple of gift features: our page featuring gifts – crafts, wine, soaps, photographs and more – made by talented lawyers-creatives who own their firms. Take some time to look at our colleagues work and try to make a purchase to support their non-legal work. All proceeds from these sales go directly to the sellers; MyShingle earns no affiliate or advertising fees. If you can’t find gifts from our lawyer-vendors, we have some other gifting options for you. MyShingle has curated these Fun & Practical Gifts for Solo and Small Firm Lawyers, suitable for your lawyer friends, suitemates or colleagues. And for lawyers who want to thank referral sources without running afoul of ethics regulations (which forbid giving something of value in exchange for client referrals), check out these curated Edible Referral and Thank You Gifts that would fall within the de minimis exception to referral gifts. 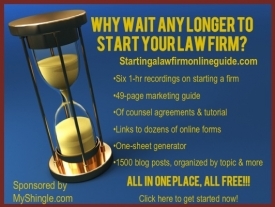 Finally, for lawyers who plan to make 2019 the year to start a law firm, along with those who support them, we’ve put together this guide on the best tools for starting out lean, particularly when you’re working from a home office of part-time coworking space. All links to goods at Amazon generate affiliate fees for MyShingle. What About a De Minimis Cost Exception To Unauthorized Practice of Law?